Fairy Tale eggplant for sale by Riverdog Farm at the Sacramento Downtown Farmer’s Market in CA. What does Fish Fragrant mean? Fish fragrant eggplant is a classic Sichuan dish from central China. There is actually no fish in this dish. Fish fragrant refers to the sauce that is often used to season fish but applied here to eggplant. The Chinese have a similarly named “lobster sauce” that actually has no lobster in it. It refers to the sauce that is often used for lobster. The fish fragrant sauce contains fermented chili bean sauce, the cornerstone of Sichuan cooking, soy sauce, ginger, rice wine, and soy sauce. The sauce would be suitable for green beans as well. 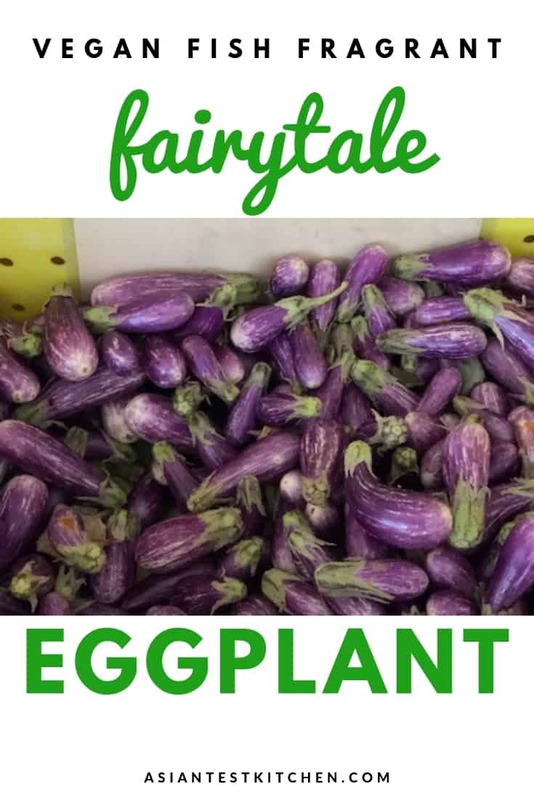 What are Fairy Tale eggplants? These are teeny, weeny, eggplant, such as if baby eggplant had babies. Each is about 2-3 inches in length and of varying thickness. They are also sold as large as one’s palm, but the smaller they are, the cuter they are. Fairytale eggplants are prized for being sweeter, creamier, and less bitter than regular eggplant. They are similar to Asian eggplants that are long and thin, such as the Chinese and Japanese varietals. The fairy tale eggplant tastes like a miniature version of the Asian variety but with striped white and purple skin. After the green tops are nipped off, pan fry the eggplant in oil to sear in the purple hue. Will it stay purple once cooked? No. Not unless you fry it. The bright purple color only remains if you sear in the color with hot oil. If you roast, grill, or bake the eggplant, it will turn a murky purple, brown color. Therein lies the trade-off for additional color comes additional calories from oil. Many Chinese preparations will deep fry a vegetable or meat first before stir-frying. This works especially well with eggplant, so the purple color shines like a royal jewel. 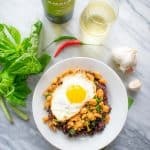 Can you use regular eggplant? Yes, just use the Asian varietal, such as a long, thin Chinese or Japanese varietal. Ovular shaped, globe eggplants are not used in Asian cooking. In addition, the seeds are usually larger and may need to be pre-salted to remove bitterness. Fairy tale eggplants are special because of the high ratio of skin to flesh. The skin adds some firmness to an otherwise very creamy, mushy eggplant. More skin also means more antioxidants. The purple skin contains anthocyanins, a pigment found in red, blue, and violet-hued fruits and vegetables. These little fairy tales get browned on both sides in a thin coating of oil in hot pan. Does this dish have a lot of oil? The eggplant is fried in a thin layer of oil then stir-fried with sauce, so it is akin to a deep fried dish. Eggplant likes to soak up oil. If you prefer to roast the eggplant to use less oil, you can. However, you will lose the bright purple hue. 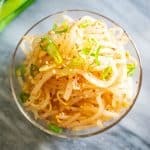 Start the sauce with minced ginger and green onion. 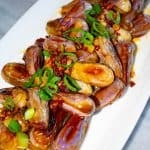 The eggplant is stir-fried with a “fish fragrant” sauce containing fermented chili bean paste, soy sauce, rice wine, green onion, and ginger. Why should you make it? The sauce is vegan and contains so much umami flavor from the chili bean paste, soy sauce, and ginger. No meat required. The eggplant is very creamy and velvety in your mouth, contrasted with the bright pungency and saltiness of the sauce. These little purple Tinkerbells are an eggplant fairytale come true. Stir-fried here with a "fish fragrant" sauce that is all vegan and anything but fishy. Substitute with Chinese or Japanese eggplant, if you can't find these small ones. Heat 1/4 c oil in a pan on medium high heat. Add eggplant and cook 2-3 minutes on both sides until tender. Transfer eggplant to a plate. Drain oil and add 1 Tb back to the cooking pan over medium heat. Stir-fry ginger, garlic, and white part of the green onion for about 1 minute. Add eggplant to the pan along with the chili bean paste, soy sauce, sugar, and rice wine. Stir-fry for 1-2 minutes for flavors to combine. 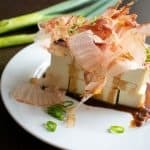 Garnish with the sliced green tops of the green onion. Chinese or Japanese eggplant can be substituted. 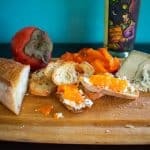 Cut into 2" rectangles or 1/2" inch round slices. Alternately, try this with green beans instead of eggplant for a more crunchy vegetable side dish. 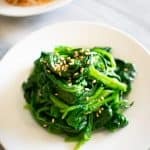 This recipe is adapted from "Yan-kit's Classic Chinese Cookbook" by Yan-kit So. The quantity and number of ingredients have been altered to exclude rice wine vinegar and wood ear mushrooms. Do you like hearing about fairytales? Please spread the Asian ♥ and share!